UNFCCC looking for three interns in knowledge management. If you are a graduate-level student interested in user experience design, records management, knowledge management or internal communications. The United Nations Framework Convention on Climate Change (UNFCCC) is the focus of the political process to address Climate Change. The Convention secretariat supports the Convention and its Kyoto Protocol through a range of activities, including substantive and organizational support to meetings of the Parties. The Communications and Outreach (CO) programme is responsible for external communications, media relations, online public information and outreach to stakeholders in support of the Convention and the Kyoto Protocol. The programme leads the public advocacy work of the Climate Change Secretariat and the strategic high-level engagement of stakeholders involved in the development of climate change policies. The programme supports the communications and outreach work of the secretariat and will seek to increase the number of outreach partnerships, in particular with the private sector and other key stakeholders, with a view to facilitating enhanced action under the Convention. The internship is for a period of minimum two to maximum six months. The exact period will be determined based on the availability of the intern and the needs of the programme. There is the possibility of an extension, subject to the intern’s on-going university enrolment and performance. The selected intern will work onsite at the UNFCCC campus in Bonn, Germany. Candidates must have completed an undergraduate degree and be enrolled in a Master's programme at a recognized university at the time of application and for the duration of the internship. Candidates must be fluent in French and English (both oral and written) and have strong writing skills. Studies in the field of public policy, public relations or journalism are preferred. UNFCCC secretariat internships are not remunerated and the selected intern will be responsible for all costs before, during and after the internship assignment. Interns of the UNFCCC secretariat are not considered to be staff members. The selected intern will work on a full-time basis (40 hours per week) at the UNFCCC premises in Bonn, Germany. 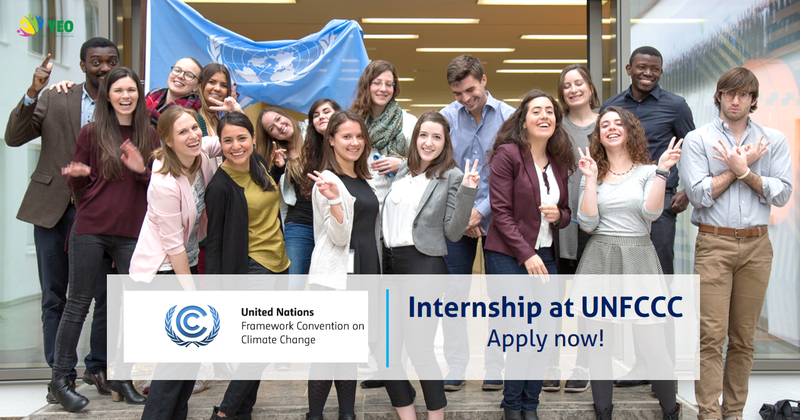 For more detailed information about UNFCCC Internship programme please visit the internships section on our recruitment webpage: https://unfccc.int/secretariat/employment/recruitment. Candidates who are interested in this assignment and meet the minimum requirements are encouraged to send their curriculum vitae and a cover letter to internship@unfccc.int with the subject line: “Application: Internship, Communications  French Newsroom and Social Media.” Due to the high number of applications, only candidates under serious consideration will be contacted for a telephone interview.